Out of Our MiNDS Workshops Have Begun! The Our of Our MiNDS crew is at it again! Check out how their latest trip to Orchard Park Secondary School went and to learn how YOU can join the team! deed, we are excited to report that on November 23rd, our Graduate Program’s educational outreach team (aka Out of Our MiNDS), delivered its 1st workshop of the year to grade 11 and 12 students at Orchard Park Secondary School in Stoney Creek. As the team set out for Orchard park, the combination of the cold, rain, and 0700h start time couldn’t dampen our excitement. When we arrived, we quickly set up and dove into the material. We start with a brief discussion on the study of the nervous system, its components, and the role that the nervous system plays in health. Next, the class was divided into 3 groups and they began the core component of the workshop; our 3 stations. These stations highlight the 3 fundamental components of neuroscience: microanatomy, macroanatomy, and neurophysiology. For the first, students view slides of the retina and cerebellum under the microscope and learn about neuronal structure. 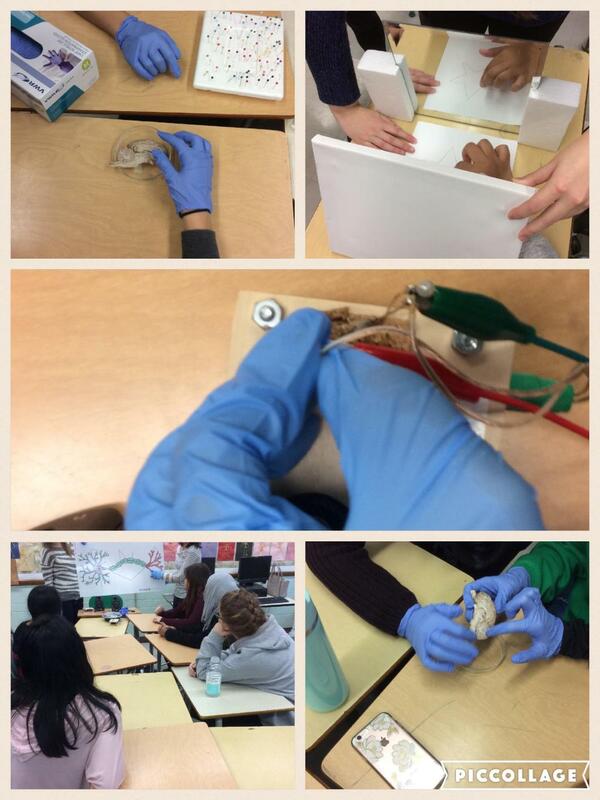 In the macroanatomy station, students learn about the structure and function of the different lobes of the sheep brain. Finally, we even incorporate top-40 music to make a cricket leg move, thereby teaching neurophysiology and signal transduction (as well as how to get down). It was amazing to look about the classroom and see every pair of eyes transfixed on the materials in each station. Students asked questions and engaged in lively discussions, both with their peers and our team. We received very positive feedback and even discussed McMaster’s new Neuroscience undergraduate program. We look forward to inspiring more young minds to think about neuroscience this year and beyond. If you are interested in sharing your passion and ideas about neuroscience with high school students in our community and joining Out of Our MiNDS to attend a workshop, please don’t hesitate to contact John Krzeczkowski or Lisa Dyce at outofourmindsoutreach@gmail.com for details about upcoming events!